Photographer @ Jesse & Lex Wedding Co.
How do I do this gal justice? Lexi and I connected in high school (on Tumblr - where else?) from opposite ends of the state, through mutual internet friends who shared our interests in writing and photography. While life carried us to a handful of different cities over the years, we've kept up with each other's work and happenings, and somehow both found home today in the corner of the universe that is Jacksonville, FL. She's my more feminine, warmhearted and down-to-earth counterpart and I'm grateful to have her in my Circle of Babes. ;) Thanks for being here, Lex! Anna Szczekutowicz, one of my oldest photography friends. Not only is she an incredibly talented photographer, but also an incredible academic. She's getting her PhD in some crazy math stuff that my little brain can barely even grasp. She also saves all of her money to travel as much as humanly possible. She's just the ultimate badass role model. A few summer ago, I went to a photography meet-up in Vancouver. 50+ of us camped on an island outside of the city for a week. It was unreal. We explored the island's trails and waded out into the frigid water. It was a family bonding experience. Lately I've been listening to Modern Love, where professional actors read out real articles from the New York Times Modern Love column. I have also been loving "Explain Things to Me" by Anna Akana and Brad Gage. It's basically like a Career Day podcast where they interview professionals from a variety of fascinating fields. It's equally intriguing and entertaining. Playing with my kitten Juniper, eating good food with friends, crafts... and working. When you work from home, free time is a weird, nonexistent thing, because there's always something to be worked on. I am currently a wedding photographer who also does reception at a badass salon three days a week, (10 hours a day.) I work alongside my talented boyfriend, Jesse Brantman. Together we are the wedding photography duo, Jesse and Lex Wedding Co. I also do a lot of side jobs, like shooting for local magazines and creating fine art self portraits. My love for photography began with just myself, a camera, and a tripod, so I always like to get back to those basics to spark creativity every so often. If I work at Hawthorn: I wake up at 8 and wish I had woken up earlier. I work out (maybe,) and eat breakfast (avocado toast - always.) I go to work forever (until 8pm,) then go home to eat dinner with Jesse. Sometimes I'll do some late night editing, other times I'll succumb to Netflix. And on the best days, we meet friends for a drink after work, and go to bed a little too late. If it's a Jesse and Lex Wedding Co. work day: I wake up at 8, work out, eat, but then usually end up playing with my cat, Juniper, for a while. Then I head to my local coffee spot, Vagabond, to edit and work on social media posts. My boyfriend, Jesse, also works from home, and we often distract one another. There is also always something to snack on at home... so getting out keeps me way more productive. Some days, we will have an afternoon shoot or a client meeting... or we'll go on a bike ride... or we'll do housework on our fixer-upper. How does anyone ever get everything done?! Being trusted by someone (oftentimes complete strangers) to capture lifelong memories, creatively. It is crazy that something that started as a passion could turn into a real career for me. 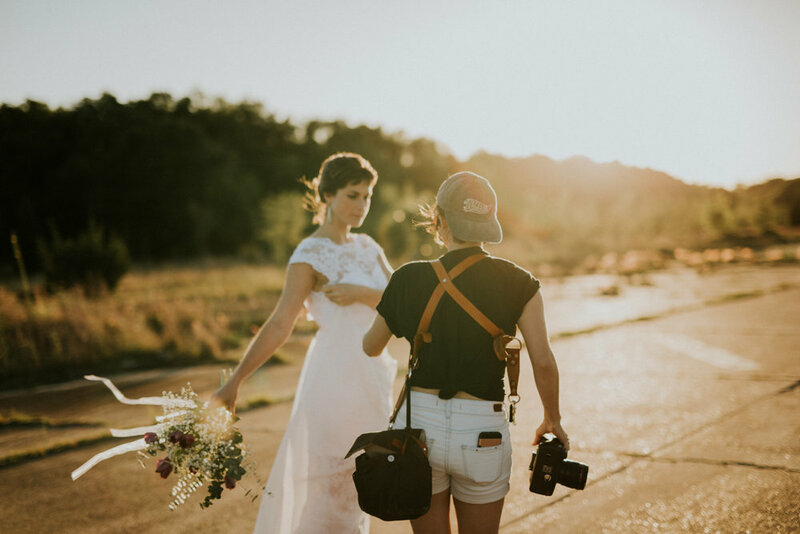 I'm so grateful for the people in my life who helped me get here - especially my best pal Emily Tebbetts, who showed me that wedding photography is a true art form. Something you wish you could change about your job? I wish someone could do the business side for me. I just want to shoot and edit all day with no other worries. Who do you want your future self to be? A badass business woman who travels around the world with her partner, photographing beautiful moments in people's lives. Also healthier. I eat way too many cookies. 1. Don't let the dark edges of your mind keep you from taking a chance! Believe in yourself. If you don't know something, do the research and learn it! There were so many times when I was considering wedding photography where I was halted by the fact that I didn't know much about running a business, or about taxes and finances. These are problems that are temporary and solvable. Remember, there are no permanent road blocks. 2. You don't have to dive in head-first in order to start a business and succeed. It's okay to work full-time while you build your business as a side hustle. Good things take time. Work towards it, and build a community around it. Photos by Lexi Mire + Jesse & Lex Wedding Co.
Sep 26 How Not to Quit Your Job.